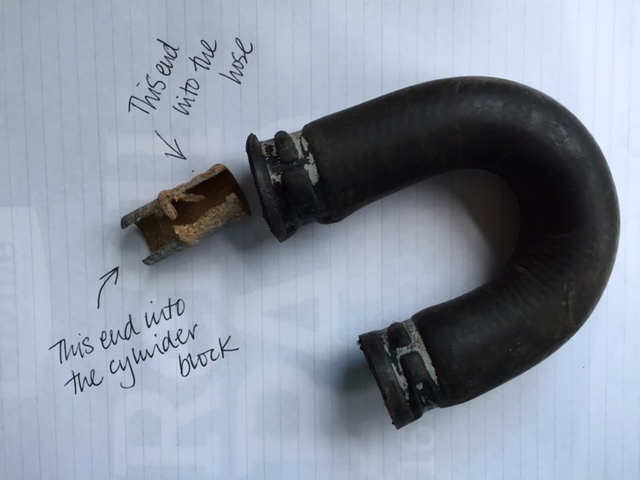 Can anyone in Europe help, P38 Diesel, the outlet feed cylinder head to heater, rear of head N/S that supplies the "U" shaped hose under the rear of the inlet manifold that connects to the heater inlet pipe, has corroded, I thought the leak was in the hose as with my other P38 DSE, but it has turned out to be the metal pipe coming from the head itself, which has come out of the head, Microcat doesn't give it a part number or list it, Rave does't show it as separate from the head, but it is corroded where it enters the head and it simply came out, not broken off. Please, is it a replaceable part, that is fixed in somehow or is it a head off and away to a specialist for repair. I'm not a diesel expert by any means but is there anything to stop you buying a piece of steel pipe of the right size (so it's a tight fit), smothering it in Loctite and tapping it into the head? That's the solution I'm inclined to for the moment, unless someone has a better, but it would seem the original is just that, a tight fit. 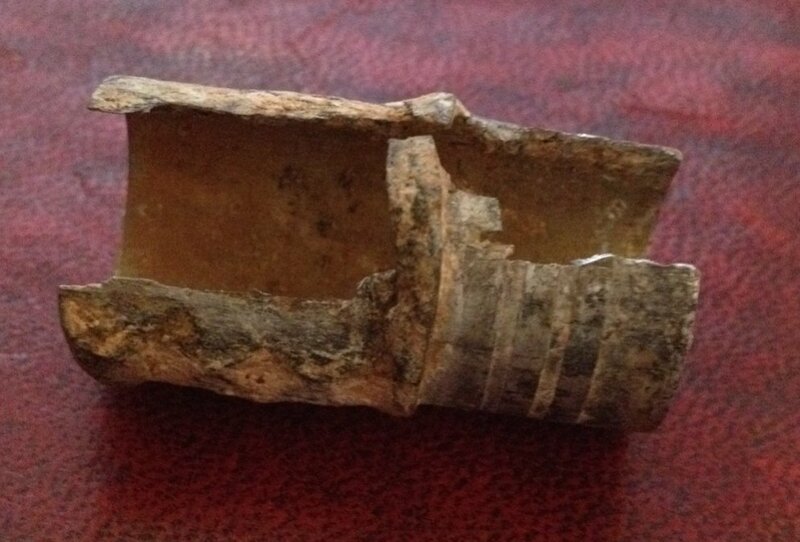 Am wondering if pipe of similar material (same temperature expansion rate) or if copper would be better as expansion would be greater with heat and therefore may seal better. Due to location, I'd worry it would likely go again leave us in a worse situation, stranded or wrecked engine. I've given this DHSE to my daughter as I can no longer walk and she exercises my dogs each day. Gilbertd's solution will work fine and probably last longer than the car, but, if you want to get really picky about it and avoid the risk of galvanic corrosion with a copper/ aluminium/ electrolyte interface then an appropriately sized aluminium tube pressed into a thoroughly cleaned joint and bonded with j-b weld original (temps up to 287C) would be the ultimate solution. As the original connector looks like a bit of steel tube then either of the above would be a more durable fix compared to the original! Have cleaned up the edges, it's brass or brass like, quite hard, trying to find something the same diameter. when I do what would be best to seal, Loc-tite, Epoxy, P38 or JB weld if it's available over here. Definitely not P38- it's body filler. 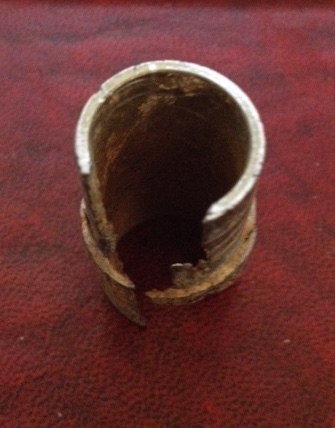 Just remembered from my early plumbing days that copper direct to iron, self destructs, has to have brass between the joints, so I'll have to find some 18mm ED brass tube. Also according to some long term users of J-B Weld have found it breaks down in contact with 'coolant'. Will wait a while considering alternatives. I have had a look at Microcat myself. You are right, there is no separate part listed for the water connection. I am not even sure how the pipe is fitted in the first place. It looks as though it is a press fit. I have also trawled through a few BMW forums, and a BMW workshop manual, and found no reference to it. To do a decent job, you are going to be faced with taking the head off, which means buying a new head gasket and stretch bolts. Personally, I would get a s/h head. You might be able to get your old head repaired by a competent machine shop. Get it bored out and get them to press in an oversized stub maybe. "Built in Britain, Perfected in Ireland"
Waking the thread up - I've just found the same problem. 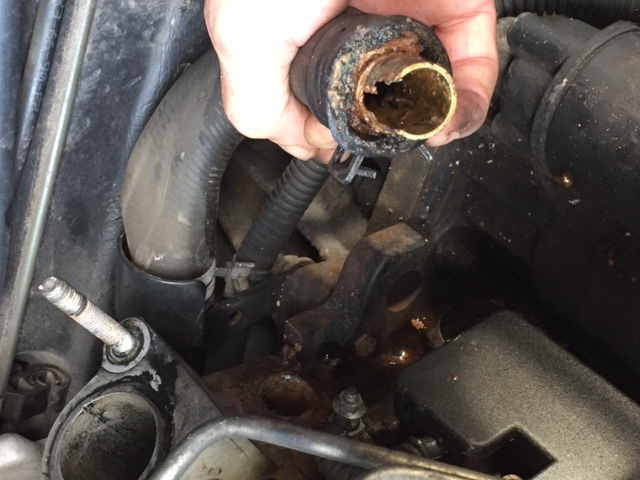 I also had to buy the coolant output pipe from the head to the radiator as that rotted away on mine. I bought a new one from Turners engineering and I'm having a pipe made up this weekend by a fab shop so the rubber pipe has something to grip to. I'll hazard a guess that if the front pipe has rotted then so has the rear one. I have temporarily fixed both of mine, the front one from 2 pieces of vacuum cleaner tubing (Henry inner as it's hard steel, the outer is a piece of Lidl down tube aluminium). Necessity is the mother of invention when you are stuck in South West France and have a 750 mile return trip! Anyway it hasn't leaked yet and next weekend I'll extract both and replace them. I did solve this, using one for a Classic, part no. ETC6547 from Powerful_UK_ltd on ebay £4.50p, it's not a perfect fit, but with JB Weld, it's lasted almost 3 years so far. The U shaped hose is also available on the bay PCH000030 is the part no. Head gasket, broken cylinder head or cracked cylinder? Heater core O-rings. Heater pipe misalignment? No. read on.